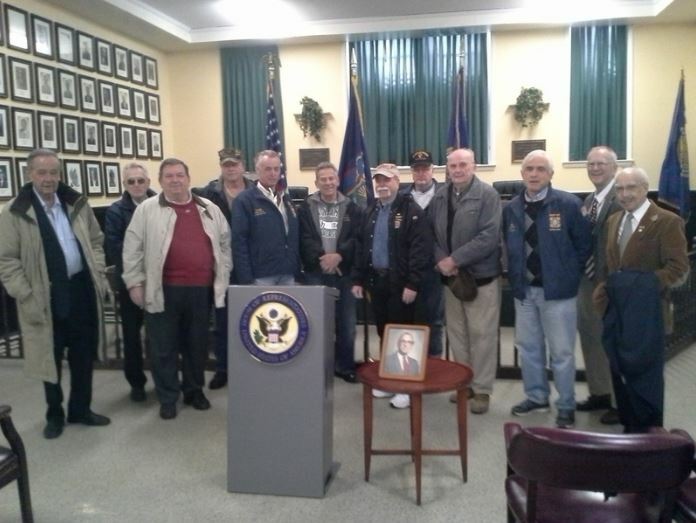 February 8, 2015 -- On Friday at Sea Cliff Village Hall, Congressman Steve Israel (D-Huntington) flanked by a dozen veterans as well as by Mayor Bruce Kennedy, Nassau County Legislator Delia Deriggi- Whitton (11th LD), and Linda Parsons, wife of late Sea Cliff Mayor and Army veteran Norman Parsons, called on the Department of Defense to reevaluate the type of evidence that can be considered in order to confirm a veteran’s record of service when the official record is unavailable. In 1973, a disastrous fire at the National Personnel Records Center destroyed 16 to 18 million Official Military Personnel Files (OMPF), leaving many veterans and surviving spouses unable to confirm their service record. After her husband's passing in 2013, Mrs. Parsons tried to obtain his Military Separation document so that she could secure benefits her husband earned from his service in the Army from 1954 to 1956. After learning that this document had been destroyed in the fire, she submitted alternative documents that provided clear and convincing evidence of his record of service. Nonetheless, without the separation paper, her benefits were denied. “It is heartbreaking that because of a devastating fire, Norm's service to his country has been erased from physical record." said Mrs. Parsons. "I know that there are hundreds or thousands of other military families going through this same ordeal and I hope that every effort possible is made to right this wrong." Representative Israel, after being contacted by Mrs. Parsons, wrote to Secretary of Defense Chuck Hagel urging the Defense Department and the service branches to address the matter. "Our nation’s veterans should not suffer due to an accident that was beyond their control, yet many of these impacted individuals are still facing unnecessary and unacceptable difficulties," he wrote. "Applying for benefits should not be a stressful or difficult task, especially for those who have sacrificed so much for their country." On Friday, the Congressmen said, “It is simply unacceptable that our veterans and their families are still being denied benefits forty years after this fire. Instead of being forced to sit in bureaucratic limbo, a new common sense system must he put in place so that a combination of unofficial evidence can be used to confirm a veteran’s service record. It is long past time that these men and women receive the benefits they deserve." Mayor Kennedy also spoke. “In addition to his military service, Norm Parsons proudly served our community for eight years as my predecessor in the Village Mayor’s office," he said. "Linda and the Parsons family deserve the benefits they are entitled to from Norm’s service without the barriers of bureaucratic red tape. I thank Congressman Israel for his leadership in ensuring that this long—standing problem is corrected." 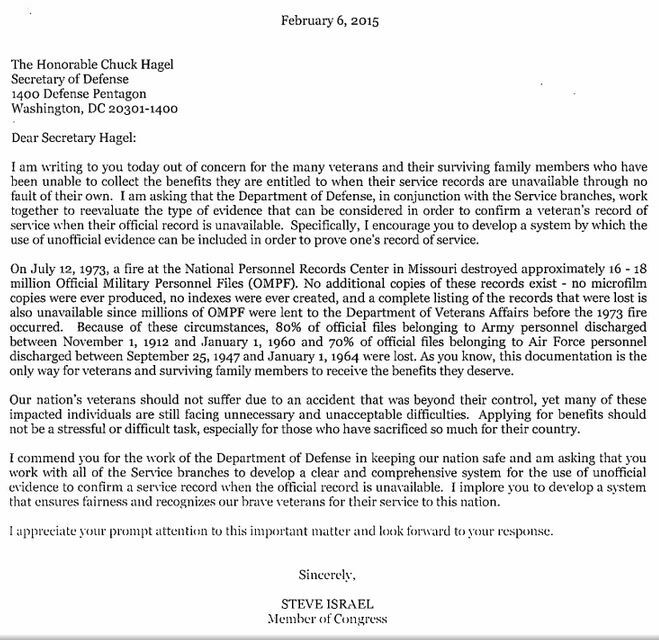 See right for Congressman Israel's letter to the Secretary Hagel.